The meeting of January 24 was our annual club auction. 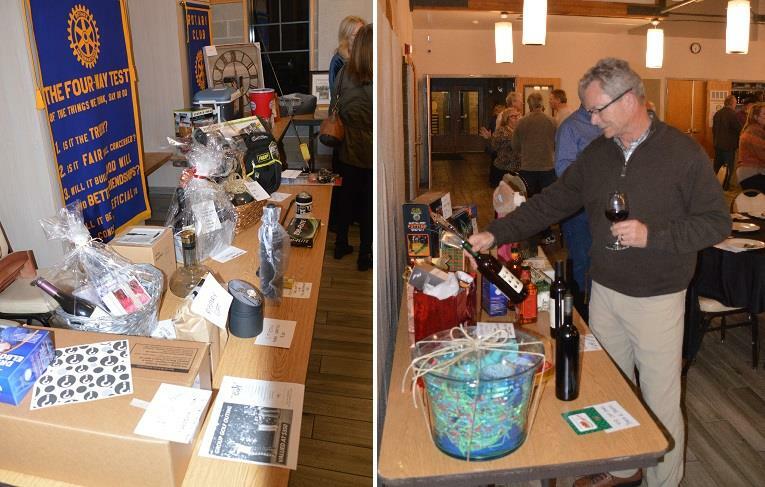 Each member had to provide a $50 or greater value gift for the auction and members were encouraged to bring guests. The club provided an open bar. There were many guests at the meeting, including District Governor Elect Ray Ward. Social hour before the meeting. Auction items to be previewed before the Don Reid checking out a bottle of wine. Charlie Grows checking out the auction items. President Dave opened the meeting without the bell resulting in difficulty getting everyone's attention. When he did have everyone's attention, he led us in the Pledge of Allegiance. No one led us in song but the club did sing "My Country 'Tis of Thee". Bob Mange offered an invocation. President Dave accepted a banner from Rotarian Dr. Usha Rani from Koganti, India. Trish Saylor announced that the Wine and Dine will be on May 5, not May 19 as originally planned. Steve Miklos announced that the March 21 meeting will be an Italian Dinner Murder Mystery. The date for labeling dictionaries is January 29, 6 PM at Dave Serpa's Chiropractic office, 513 Natoma Street. Auctioneers were Joe Hoffman and Bob Hoffman. Joe and Bob Hoffman There's the bell, auctioned off to President Dave for $45.00.